Now you may wonder what on earth a Dartmoor tor has to do with the hobbyhorse and you would have to go back to the prehistoric days when iron was just starting to be used to find out. In those dim and distant times the local tribe in Devon were the Dumnonni and they were a mighty race, their lands stretched from the north coast which look upon the lands of the Silures to the south coast which led to Gaul. They then reached to the lands of the Cornauii in the west and to the Veneti lands in the east. This was still in the days of the old Gods who lived amongst the lofty granite tors of Dartmoor. There was ‘Old Crockern‘ who dwelt on Crockern tor, Cernunnos the horned god who lived at Devil’s tor, Eastre the moon goddess who lived on Yes tor, and Baal whose home was on Bellever tor. 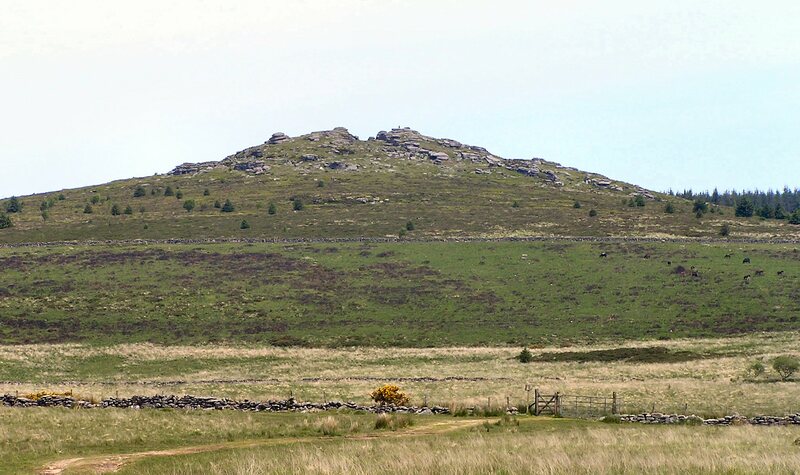 Baal was the most popular god and so Bellever, being at the centre of Dartmoor, was the most appropriate place for him to dwell. One day the old Dumnonni tribal leader died so a huge burial ceremony was held for him. His body was carried up past Bellever tor and on to the tribal ritual centre on Lakehead Hill. Here in a small, roofless hut his body was placed on a wooden platform. It would be left there until the ravens had eaten all his flesh, by doing this the birds would take his soul up to the world of the ancestors as they flew into the skies. As this gruesome ritual was taking place the tribe began to look for a new chieftain. There was much argument and debate as to who it would be. The arguments turned to quarrels and the quarrels turned to fights and in the end there were three more men to bury. The Druids were summoned to settle the dispute and decide how to select the new chief. After great deliberation the Druids decided to go to the nearby sacred grove at Wistman’s Wood to consult the gods. The following day they returned to Bellever and announced that the man or indeed woman who could shoe the mystical mare would be leader. The mystical mare was a beautiful jet black horse that belonged to Baal. She was as wild as the north wind and was the sacred symbol of the Dumnonni, no mortal dared to go near here for fear of her quick temper and flashing hoofs. It was said that a kick from her would mean certain death so anyone who could shoe her had certainly earned the right to become chief of the tribe. It was decided that the contest would take place in two days time on the feast of Beltane. The people soon began to speculate as to which of the warriors could accomplish the task. It soon became apparent that there were two favourites, Henga and Bran. Henga was the headman for a clan that lived up on the high moors. He and his people worshipped Eastre the goddess of the moon and Henga was a particular favourite of hers. Bran was a humble blacksmith who lived in a small cave on nearby Loughtor. Henga hated Bran with a passion, the main reason being that Ina, the prettiest girl in the tribe loved Bran and Henga wanted the girl for himself. He also knew that Bran had a way with animals and deep down knew that if anybody could shoe the sacred mare it would be Bran. So Henga, with the help of some eldermen of the tribe hatched a plot that was sure to end in Bran’s downfall. That night they stole the mystical cauldron that belonged to the Dumnonni and the all swore that they had seen Bran take it. Sure enough, a band of warriors were sent over to the cave to capture Bran who was brought before the Druids to account for his crime. The Arch Druid passed sentence, Bran was to be the Beltane sacrifice for the mighty god Baal. Those loyal to Bran knew that he would not commit such a crime and decided to help him. They knew that the contest to shoe the sacred mare would be held when the sun was at its highest and that the sacrifice to Baal would be made when the sun was at its lowest. This meant that if he could shoe the horse then he would be the new chieftain and no Druid would dare sacrifice the leader of the Dumnonni. So that night Ina went to the top of Bellever tor where she knew there was a secret passage that lead deep down under the mighty granite pile. At the end of the passage was a huge cave where the Dwarfs mined for silver. Her plan was to go down and ask the little folk to make a set of magical horse shoes which after much pleading they did. Ina then went to where Bran was being held and gave him the horse shoes. The following day the horse was led bucking and kicking to a small sacred standing stone near Loughtor, here it was tethered to the granite pillar and still it shied and stamped. The first man to try to shoe the mare immediately received a kick to the head which dropped him like a stone. The next man at least managed to briefly get hold of a leg before being hoofed to the ground. As the pile of wounded warriors grew the Druids were becoming concerned, what would they do if nobody could shoe the horse? The sun rose higher and higher in the blue cloudless sky and just as it cast its noon day shadow across the standing stone a Henga strode up to take his turn. Now the sacred horse knew that Henga had falsely accused Bran of stealing the cauldron and as soon as he came near the mare snorted, reared, bucked and then let out a vicious kick that hit Henga and sent him flying across the moor into the sea. Now the Druids really became worried because if Bran shoed the horse then they would lose face as they could not sacrifice him and if he didn’t there was going to be no peaceful way of choosing the new chieftain. Bran slowly walked up to the mare who gave a mighty snort, her ears pricked and her tail swished. The blacksmith ignored this, after all he had seen it many times before. From his pocket he took a small morsel of bread and gave it to the mare, then he produced the Dwarf’s silver shoes and showed them to her. She was delighted, they were truly magical and although she had never been shod before she decided that these shoes were befitting a sacred horse. Bran gently lifted each leg and fixed a shoe to each hoof, when they were all in place he jumped onto her back and rode her slowly through the crowd of cheering tribes people, his people. Over on Yes tor, Eastre had been watching the contest and was beside herself with rage. If Henga had won that would have meant that the whole of the Dumnonni would worship her, but now Bran was the new chief the tribe would continue to worship her hated enemy, Baal. She hurried down to Devils tor to see Cernunnos, he too detested Baal and together they decided to go over to Bellever and kill the god of the sun. That way they both could rule the dark, sunless world. Baal could see his enemies stomping across the moor and so quickly donned his armour and took up his mighty sword. The Dumnonni fled in terror and hid among the huge granite boulders of Bellever tor. A mighty battle ensued and Baal was not doing at all well, he could see that the combined forces of Eastre and Cernunnos were too much for him. Luckily, Old Crockern had heard the noise and had come across to see what was happening. Crockern soon realised that Baal was in serious trouble so he waded into the very heart of the fight. His huge, granite body parted the brawling gods. He grabbed Eastre in one arm and Cernunnos in the other and shouted at Baal to mount the sacred mare and ride away. Baal didn’t need telling twice, he leapt onto the horse’s back and sped off towards the sea. Once Crockern was sure that Baal was safe he released the other two gods from his granite grip. Slowly peace was restored, the gods went back to their tors and Bran and his tribe continued with the Beltane feast at Bellever tor. Over time the Dumnonni tribe was absorbed into other tribes and then other races until all but their traditions and relics were left. The old gods were forgotten and a new single god replaced them. Eastre left yes tor and Cernunnos vanished from Devil’s tor. Some say only Old Crockern stayed on Dartmoor and he just sleeps all the time under Crockern tor. But reminders of Baal and Bran can be seen today when at the time of the old feast of Beltane, which we now call Mayday, hobby horses are brought out in celebration of the old gods. Bellever tor – June 2005. This story appears in a small book of Dartmoor tales that was published in 1939. 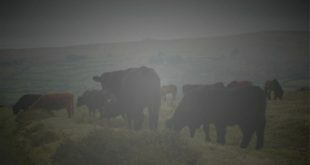 No other version of this story appears anywhere else and I would humbly suggest that this is pure fiction with no tradition on Dartmoor. I have included it because it does make quite a good story. Warren House Inn = 021.5 HP Bellever tor = 254 Telegraph Pole = 312 Large Gorse Bush = 161 Box in centre of large gorse bush.